The Children’s Museum of Pittsburgh has undertaken an ambitious adaptive reuse project to provide a new and innovative center for education in a structure that once housed the first commissioned Carnegie Library. The nearly 130 year old building is listed on the National Register of Historic Places and strives to achieve LEED v4 Gold certification, WELL Silver, and meet progress targets for the Pittsburgh 2030 District. BranchPattern led an eco-charrette with the owner to establish project goals. In addition to the desire for improved energy performance, healthy indoor environments emerged as a key objective. Other guiding principles included a desire for the space to be dynamic, open, nurturing, and visible. The target energy use goal for this project, dictated by the Pittsburgh 2030 District for library use types, is a 70% reduction from the baseline of 156 kBtu/ft2/yr, which resulted in a site EUI of 68.6 when adjusted for purchased renewable energy credits. Since the existing building is historic in nature, insulating and improving the facade was a unique design challenge. Exterior walls are comprised of granite block on the exterior backed by four wythes of solid brick and plaster finish on the interior. To improve thermal performance of the existing masonry walls, using traditional furring strips and insulation behind gypsum wall board was not an option because it would have increased the wall depth and covered decorative cornices at the ceiling. 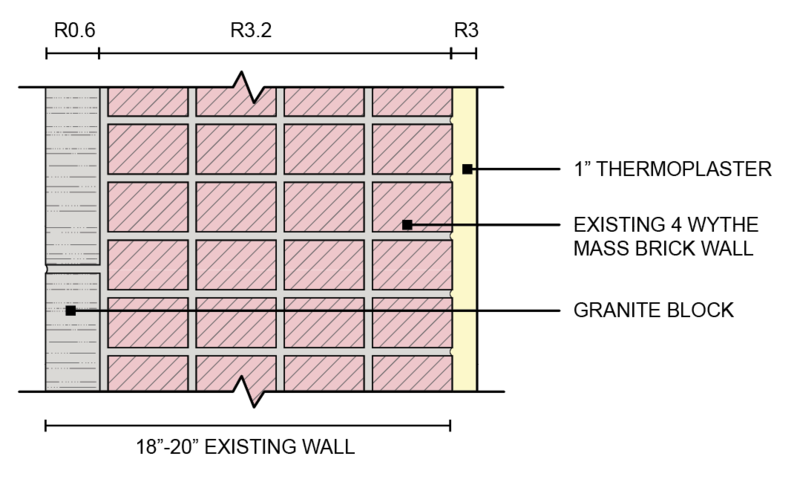 As a result, BranchPattern’s Research & Development team discovered a unique thermoplaster product from Italy, Diathonite Evolution, that provided R3 per inch of material, which nearly doubles the wall assembly’s thermal resistance. In addition to improving thermal performance, it does so with a very low environmental footprint. All existing single pane glass windows are also planned for replacement with double pane glazing. Daylight modeling was used to document identify areas with glare and to test compliance with LEED requirements for Indoor Environmental Quality.